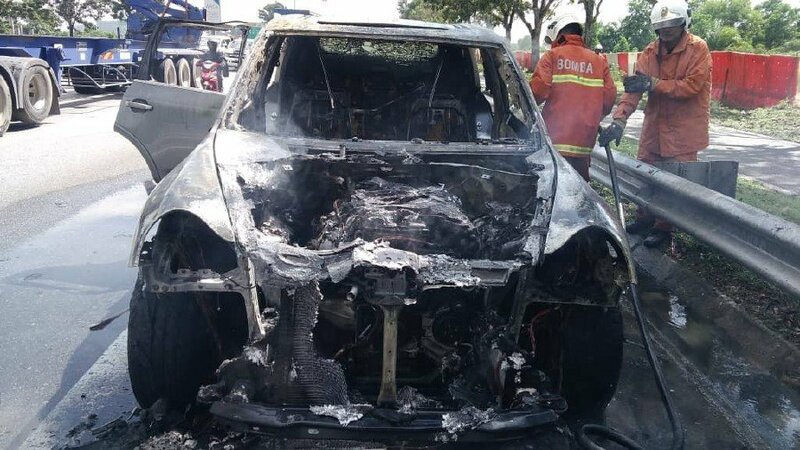 SHAH ALAM: A Porsche Cayenne cruising along the Shah Alam Expressway (Kesas) here, yesterday, suddenly caught fire and was 80 per cent destroyed by the ensuing blaze. It is learnt that the 50-year-old driver, who was en route to Putra, noticed smoke emerging from his vehicle’s dashboard and immediately pulled over into the emergency lane. As he contacted authorities on his mobile phone, the sports utility vehicle (SUV) burst into flames. Seri Andalas Fire and Rescue Department chief Senior Assistant Superintendent A Romzi Abu said they received a call on the situation at 11.05am. He said five firemen took 20 minutes to douse the blaze, which appeared to have started in the SUV’s engine.